"Nacho" and "NACHOS" redirect here. For the instructional operating system, see Not Another Completely Heuristic Operating System. For other uses, see Nacho (disambiguation). 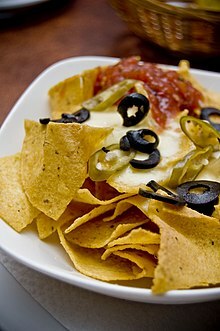 Nachos is a Mexican dish from northern Mexico that consists of heated tortilla chips or totopos covered with melted cheese (or a cheese-based sauce), often served as a snack or appetizer. More elaborate versions of the dish add other ingredients, and may be substantial enough to serve as a main dish. Ignacio "Nacho" Anaya is credited with creating the dish around 1943; the original nachos consisted of fried corn tortilla chips covered with melted cheese and sliced jalapeño peppers. Nachos originated in the city of Piedras Negras, Coahuila, Mexico, just over the border from Eagle Pass, Texas. In 1943, the wives of U.S. soldiers stationed at Fort Duncan in nearby Eagle Pass were in Piedras Negras on a shopping trip, and arrived at the restaurant after it had already closed for the day. The maître d'hôtel, Ignacio "Nacho" Anaya, created a new snack for them with what little he had available in the kitchen: tortillas and cheese. Anaya cut the tortillas into triangles, fried them, added shredded cheddar cheese, quickly heated them, added sliced pickled jalapeño peppers,[Note 1] and served them. When asked what the dish was called, he answered, "Nacho's especiales". As word of the dish traveled, the apostrophe was lost, and Nacho's "specials" became "special nachos". Anaya went on to work at the Moderno Restaurant in Piedras Negras, which still uses the original recipe. He also opened his own restaurant, "Nacho's Restaurant", in Piedras Negras. Anaya's original recipe was printed in the 1954 St. Anne's Cookbook. The popularity of the dish swiftly spread throughout Texas and the Southwest. The first known appearance of the word "nachos" in English dates to 1950, from the book A Taste of Texas. According to El Cholo Spanish Cafe history, waitress Carmen Rocha is credited with making nachos in San Antonio, Texas, before introducing the dish to Los Angeles at the cafe in 1959. 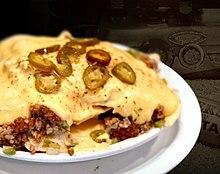 A modified version of the dish, with cheese sauce and prepared tortilla chips, was marketed in 1976 by Frank Liberto, owner of Ricos Products, during Texas Rangers baseball games at Arlington Stadium in Arlington, Texas. This version became known as "ballpark nachos". During the September 4, 1978 Monday Night Football game between the Baltimore Colts and Dallas Cowboys, sportscaster Howard Cosell enjoyed the name "nachos", and made a point of mentioning the dish in his broadcasts over the following weeks, further popularizing it and introducing it to a whole new audience. Ignacio Anaya died in 1975. In his honor, a bronze plaque was erected in Piedras Negras, and October 21 was declared the International Day of the Nacho. Anaya's son, Ignacio Anaya, Jr., served as a judge at the annual nacho competition until his death in 2010. The nutritional breakdown and total calorie count for a serving of nachos typically depends on the type of nacho, type of cheese, and additional toppings (such as beef, jalapeños, etc.) that are included in the serving. Most typical corn tortilla chips contain about 15 calories per chip. Baked corn tortilla chips have about 6 calories per chip, making them a healthier alternative option to the usual fried chip. Mexican-style cheddar cheese contains about 110 calories per ounce. Adding an additional source of protein, such as chicken or beef, increases the calorie count by about 100 calories or so. All in all, a single serving of nachos can contain as much as 300–600 total calories. A single serving of nachos also contains significant amounts of fat, sodium, and calcium. There are around 16 grams of fat, 816 mg of sodium, and 272 mg of calcium per serving of nachos. In other words, one serving contains 39% of the daily value for fat, 34% of the daily value for sodium, and 27% of the daily value for calcium. A variation consists of a quartered and fried tostada topped with a layer of refried beans and/or various meats and a layer of shredded cheese or nacho cheese, topped with habanero hot sauce. Other variations include barbecue nachos (in which cheese is replaced with barbecue sauce) and poutine nachos (in which cheddar cheese is replaced with cheese curds and gravy). Although those variations use nontraditional ingredients, these versions are still classified as nachos. Traditional nachos consist of the tortilla chips topped with cheese and jalapenos, as done by Anaya who created "nachos". The modern form of nachos has several possible ingredients with the most common toppings being, cheese, guacamole, salsa, sour cream, jalapenos, and sometimes lettuce. Lettuce is a less common topping, if added at all. The topping of the greatest quantity is often the cheese. Nachos vary from the modern style served in restaurants to the quick and easy nachos sold at concession stands in stadiums. 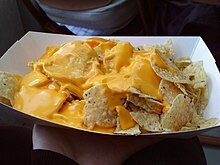 The nachos sold at concession stands consists of tortilla chips topped with pump-able cheese sauce. The cheese sauce comes in condensed form to which water or milk and pepper juice are added. What is contained in the condensed form itself is a trade secret. Another variation of nachos is "dessert nachos". These vary widely, from cinnamon and sugar on pita chips to "s'more nachos" with marshmallow and chocolate on graham crackers, and typically refer to a dessert consisting of scattered toppings on some form of crispy base. Nachos with an abundance of toppings are sometimes called "loaded nachos", "super nachos", or "epic nachos". This type of dish is usually served as an appetizer at bars or restaurants in the United States and elsewhere. 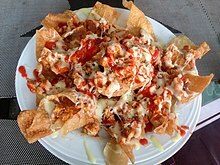 Typically, the tortilla chips are arranged on a platter, meat and refried bean toppings are then added, and the entire platter is smothered with shredded cheese. The platter is then put into a broiler or microwave to cause the cheese to melt. The platter is then covered with the cold toppings (shredded lettuce, tomatoes, salsa, jalapeños, etc.) and served immediately. In Memphis, Tennessee, barbecue nachos are served in most barbecue restaurants, and also at sporting events. Generous portions of barbecued pork shoulder are placed atop tortilla chips, then covered with melted cheese or nacho cheese, barbecue sauce, and sliced jalapeño peppers. In Hawaii, kalua pork and pineapple nachos are served in many restaurants and bars. Generous portions of kalua pork and pineapple bits are placed atop tortilla chips, then covered with melted cheese or nacho cheese, and varied toppings. A similar dish that involves tortilla chips and cheese is found in Tex-Mex restaurants. Small bowls of chili con queso and/or, more commonly, salsa, are served with baskets of warm tortilla chips as appetizers. A form of processed cheese sauce mixed with peppers and other spices is often used in place of freshly shredded cheese in institutional or large-scale production settings, such as schools, movie theaters, sports venues, and convenience stores, or wherever using freshly grated cheese may be logistically prohibitive. Though originally formulated as a cheaper and more convenient source of cheese to top nachos, this dip has become popular enough in the U.S. that it is available in some Mexican-themed restaurants, and at major grocery stores, in both name-brand (Frito-Lay, Tostitos, and Taco Bell) and unbranded versions. In the United States, National Nacho Day is celebrated on November 6. The International Nacho Festival is held between October 13 and 15 at Piedras Negras, the birthplace of nachos, and features live music, art, cultural activities, and a "biggest nacho of the world" contest which is registered with the Guinness World Records. On April 21, 2012, the world's biggest serving of nachos was made by Centerplate at University of Kansas in Lawrence, Kansas, United States. It weighed 4,689 pounds and contained 765 pounds of nacho chips, 405 pounds of salsa, 323 pounds of tomato, 918 pounds of meat and beans, and more than 2,200 pounds of cheese. 1.^ Anaya's son, Ignacio Anaya, Jr., is quoted as saying "My father was maître d' and he said 'Let me go quick and fix something for you.' He went into the kitchen, picked up tostadas, grated some cheese on them—Wisconsin cheese, the round one—and put them under the salamander (a broiling unit that browns the top of foods). He pulled them out after a couple of minutes, all melted, and put on a slice of jalapeño." ^ Strong, Franklin (2012). Herrera-Sobek, Maria, ed. Celebrating Latino Folklore: An Encyclopedia of Cultural Traditions. ABC-CLIO. p. 825. ISBN 9780313343407. Retrieved 26 March 2016. ^ a b c d Orr, Adriana P. (July 1999). "Nachos, anyone?". OED News. Oxford University Press. Archived from the original on 2010-01-02. Retrieved 2011-07-26. ^ a b c d Haram, Karen (2002-02-14). "The Legend of Nacho's Appetizer". Sun Sentinel. Sun Sentinel. Retrieved 18 July 2011. ^ Myers, Dan (September 19, 2014). "The invention of nachos and other juicy origin stories". foxnews.com. Retrieved February 12, 2018. ^ a b Ellerbee, Linda (2005). Take Big Bites: Adventures Around the World and Across the Table. Penguin. pp. 73–74. ISBN 0-399-15268-7. ^ "Waitress Who Introduced L.A. To Nachos Dies". Morning Edition. October 17, 2008. National Public Radio. ^ K. Annabelle Smith (May 7, 2013). "The History of Baseball Stadium Nachos". Smithsonian. Retrieved May 13, 2013. ^ Munsey; Suppes. "Arlington Stadium". Ballparks.com. Retrieved 2008-12-30. ^ "History". Originators of Concession Nachos. Ricos Products Co., Inc. Retrieved 2008-12-30. ^ Sokolov, Raymond (2006-02-06). "The Search for the Perfect Nacho". Wall Street Journal. Retrieved 2008-06-27. ^ David Hendricks (November 7, 2017). "'Father of nachos' Liberto dies day shy of National Nacho Day". mysanantonio.com. ^ Wasserman, Robin. "Calories in Nachos & Cheese". LIVESTRONG.COM. Retrieved 2017-04-10. ^ "Nachos, with cheese Fast foods nutrition". www.weightchart.com. Retrieved 2017-04-10. ^ "The Ultimate Nacho Infographic". www.nachosny.com. Retrieved 2017-04-10. ^ "The History of Baseball Stadium Nachos". www.smithsonianmag.com. Retrieved 2017-04-10. ^ "Dessert Nachos". www.julieseatsandtreats.com. Retrieved 2017-04-10. ^ "21 Dessert Nachos". www.buzzfeed.com. Retrieved 2017-04-10. ^ "Our Food: The Menu: Nachos & Sides". Tacobell.com. Taco Bell Corporation. Retrieved 2008-12-30. ^ "NationalNachosDay.com". NationalNachosDay.com. Retrieved 2017-04-09. ^ a b Land, Carla. "International Nacho Festival at Piedras Negras, Mexico". mexicolesstraveled.com. Retrieved 2017-04-09. ^ a b "Largest serving of nachos". Guinness World Records. Retrieved 2017-04-09. Dunne, Mike. (January 28, 2004). "One spicy tale: 'Macho Nachos'". Sacramento Bee, p. F1.